An investigation by the Caddo-Shreveport Financial Crimes Unit has led to the recovery of more than $4,000 in counterfeit money and the arrests of five people, said Sheriff Steve Prator. Between March 5 and 12, the suspects attempted to pass six counterfeit $100 bills at three different businesses on North Market Street. An investigation by Caddo Sheriff’s Det. Jeremy Edward led to the arrests of Annette Schoen, 43, Christopher Gipson Jr., 22, and Calvin Phillips, 33, for negotiating or attempting to negotiate the counterfeit money. Upon further investigation, detectives were led to a room at the Ramada Inn, 5555 Financial Plaza, where they executed a search warrant and recovered two laptop computers, printing paper, a printer, four cell phones, cutting devices and approximately $4,000 in printed counterfeit $100 bills. A small amount of methamphetamine was also seized from the room. Edward DeYoung, 45, and Antonia Hernandez, 38, were staying in the room and were both arrested. The counterfeit money seized from the room also linked DeYoung and Hernandez to the other arrested suspects and the six counterfeit $100 dollar bills that were passed on North Market Street. Both DeYoung and Hernandez were arrested on 45 counts of monetary instrument abuse and one count each of possession of schedule II. Schoen, Gipson, and Phillips were each charged with one count of monetary instrument abuse. All were booked into Caddo Correctional Center. Caddo Sheriff's Det. Jeremy Edward and Shreveport Police Det. 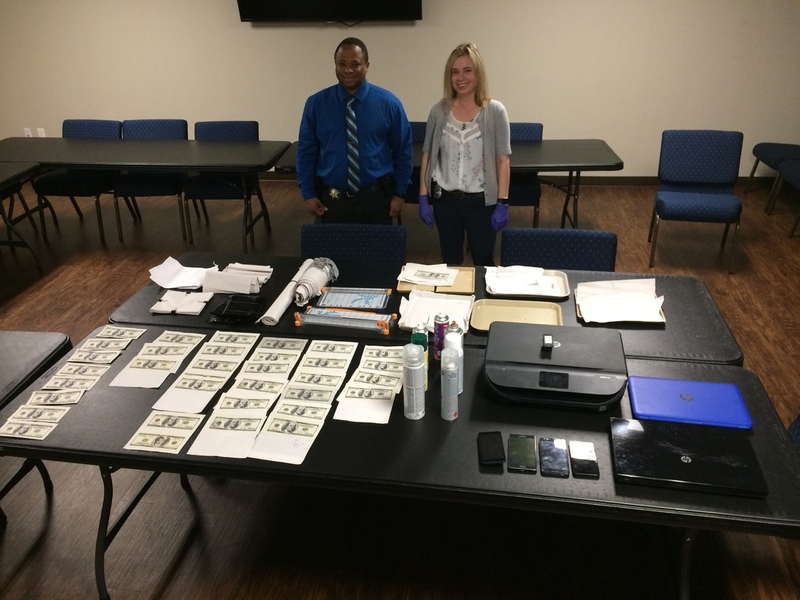 Sara Brown of the Caddo-Sheveport Financial Crimes Unit stand with evidence seized during a counterfeit money investigation.